I’ve almost finished unpacking (from both DC and Utah—the floor of the guest bedroom was awash in my various bags). In the process, I unearthed this hangtag, which I’d made Mr. Karen give me when he took it off his new ski bibs (half price in the shop at Powder Mountain, and much needed as his old bibs are so sun faded and worn thin that I’m surprised they’re still in one piece). 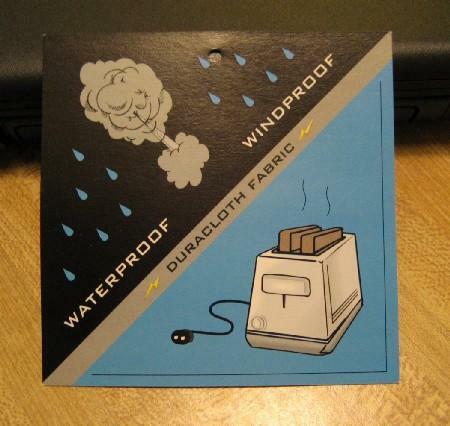 The cloud is pretty cute—his face shows how hard he’s working at trying to blow through the Duracloth Fabric—but it’s the toaster that really makes me happy. “Your new outdoor clothing will keep you so warm”, it says, “just look at the heat rays coming off this toast; it’ll be like that”. Never mind that the toaster isn’t even plugged in.